At EazyStock, we understand that managing inventory turnover is similar to a high wire balancing act. Download this guide to learn about the keys to successfully managing your inventory turnover without losing your balance along the way. 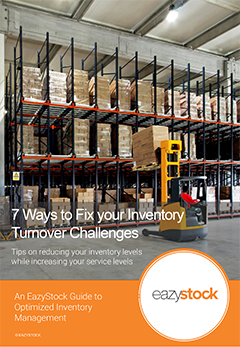 The guide 7 Ways to Fix Your Inventory Turnover Challenges covers strategies that will prove to increase your product turnover ratios without having to sacrifice your service delivery or customer satisfaction.